Suppose you have a variable that contains leading zeros. You wish to eliminate leading 0s from the variable in SAS. The following program creates a sample dataset which would be used to demonstrate the trick to remove leading zeros in SAS. 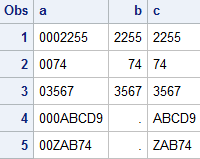 Variable c contains all the values after removing leading zeros. This trick is more robust as it takes care of both character and numeric values with leading zeros. 6 Responses to "Remove leading zeros with SAS"